One Thousand Dungeons! One Million Monsters! Experience the Flower of Adventure. 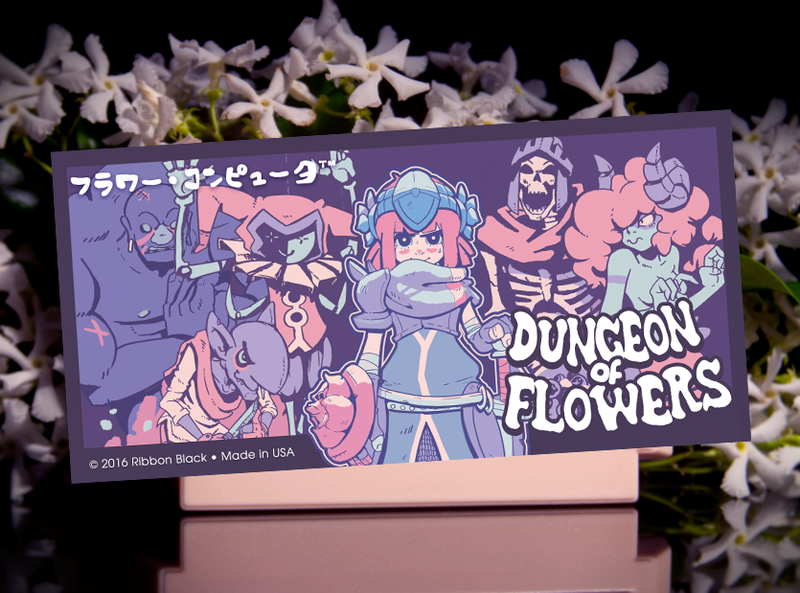 Dungeon of Flowers is my entry for this year's Famicase Exhibition, which you can see more of in my previous post (and everywhere else on the blog). The premise involves a hellish monster cave that becomes a pastel underworld when a mysterious series of earthquakes leads to thousands of sinkholes, peppering the formerly dark dungeon with shafts of sunlight. The resultant explosion of floral growth sends the monsters into an uproar--but some of them might like the change? In this dungeon crawling game in the tradition of Wizardry, the player takes the role of a knight sent to investigate the unrest in the newly dubbed "Dungeon of Flowers", while making a few friends along the way. With their help, can you bring color to the deepest, darkest levels of the dungeon? What about the thing that created the earthquakes? When I drew this I just liked the idea of a cartridge label with the hero surrounded on all sides by enemies, but the idea that THESE guys (even the screaming skeleton) are the allies that want to help you spread the flowers around is too good, so I'm going with that. And yes, the skeleton would only communicate with tormented, reverberating screams. So this was no ordinary Flower Delivery order. I was asking to re-create the centerpieces from our wedding for my wife. They quickly responded to my email with all the information I needed, and what she envisioned the arrangement would look like.